Chantel McGregor is a Bradford-based singer, songwriter and guitarist. 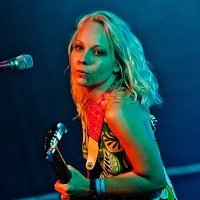 She won the "Young Artist of the Year" Award at the British Blues Awards 2011 and "Female Vocalist Of The Year" in both 2012 and 2013 and "Guitarist of the Year" for 2013 and 2014. McGregor released her debut album, "Like No Other" in 2011, with the follow-up "Lose Control" released in 2015.